Canon has finally put an end to rumors of a new EOS Rebel SL3 DSLR by confirming that the model is on the way. 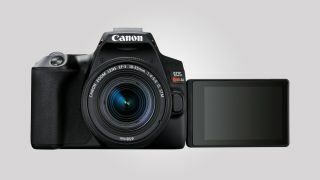 The Rebel SL3, which is also known as the EOS 250D and EOS Kiss X, is Canon's smallest and lightest DSLR yet, weighing 15.84oz/449g. It echoes its predecessor in offering a 24.1MP APS-C sensor, although this has now been partnered with the company's latest DIGIC 8 processor – the same engine that starred in the EOS M50 and EOS R among other cameras. That combination delivers a sensitivity range of ISO100-25,600, which can be extended to a setting equivalent to ISO51,200 where required. It also now allows for 4K video recording to 24p – a first for an EOS DSLR at this level. The microphone port from the EOS Rebel SL2 has been maintained, although there's no space for a headphone socket alongside. Burst shooting, meanwhile, can be carried out at a rate of 5fps, while built in Wi-Fi and Bluetooth allow for wireless image transmission and remote control from smartphones and tablets. The camera's 9-point AF system also features a new Spot AF mode, which is said to help users focus on a precise area within a subject, while Dual Pixel CMOS AF can be used in live view and for Full HD video recording. When shooting in live view, it's also now possible to call upon Eye Detection AF to keep a subject's eyes sharp and in focus. The new camera also carries over the SL2's 3in, vari-angle LCD, which has a 1.04million-dot resolution and is sensitive to touch, and also packs an optical viewfinder that covers around 95% of the scene. Other features include a 4K time-lapse shooting mode, together with a new Smooth Skin option and Digital Lens Optimizer. Battery life, meanwhile, has a CIPA rating of 1,070 shots per change – not the best in its class but very respectable nonetheless. The Rebel SL3 / EOS 250D will go on sale towards the end of April in Black and White finishes, at a price of $599.99/£529.99 for the body on its own. Those wanting to grab the camera with the EF-S 18-55 f/4-5.6 IS STM can do so for $749.99/£659.99.